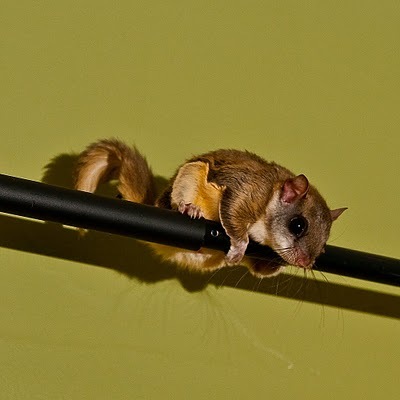 Here is a photo of the type of "squirrel" we've been dealing with in our attic. This one appeared in our living room tonight without any invitation, probably due to the cold weather we're having again. It (and the others I've removed over the last few months) are apparently southern flying squirrels. Our cat Jose chased him into the kitchen and we thought he would take care of everything. Except all he wanted to do was play with the stupid thing. I was called to the scene to dispatch the squirrel and save the women folk and in short order peace was restored to the homestead. I'm a little scared . . .